For any non-magnetic coatings on steel such as paint, enamel, chrome, zinc, etc. For any insulating coatings on non-ferrous metals such as paint, anodizing, ceramics on aluminum, copper, zinc die-cast, brass, etc. The battery-operated gage features a backlit display and a one meter sensor cable. The newly developed one pole sensor is made of a wear-and-tear resistant carbide material to ensure a virtually unlimited life cycle under normal condition use. An optimal ram - and impact - protection is provided through the rubber rimmed casing. 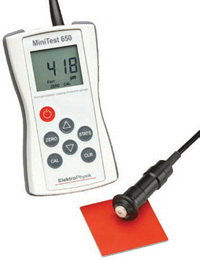 Via an USB interface, the MiniTest 650 can be connected to a PC for on-line measurements or display of the statistics. Its dual sensor identifies the substrate material. Upon contact with the surface, the gage automatically switches to the suitable measuring principle based on your application. The measuring principle conforms to the DIN, ISO, BS and ASTM norms and standards. Designed for durability and high-precision, MiniTest 650 is the ideal tool for any measuring task in the finishing industry. The rugged and easy-to-handle thickness gage combines extended mechanical life on the one hand and high accuracy on the other hand to meet the requirements of any professional user in the shipbuilding, automotive, bridge building, construction or other industry. aluminum, copper, zinc die-cast, brass, etc. Available with NIST Certification. Add /C to the part number and $200.00 to the price.